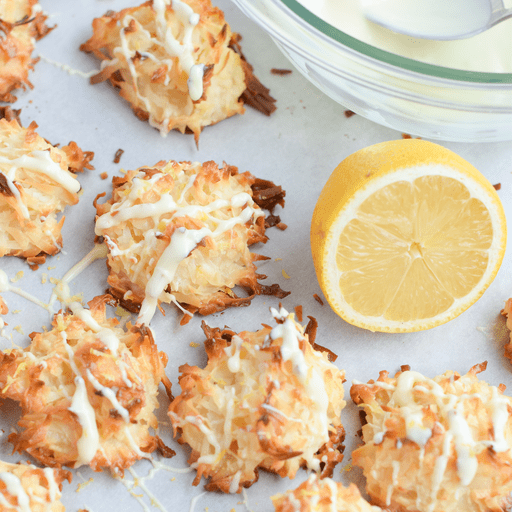 If you like lemon and coconut, you'll love these. Super simple and delectably sweet, these macaroons are perfect for spring (or any other time of year)! 1. Preheat oven to 325°F. 1. Place coconut, sweetened condensed milk, lemon zest, lemon juice and vanilla extract in a large bowl. Stir to combine and set aside. 1. Place egg whites and salt in a large mixer bowl and whisk on high until stiff peaks form. Fold egg whites into the coconut mixture. 1. Line a baking sheet with parchment paper and drop rounded tablespoons of the mixture onto the baking sheet. Bake for 25 to 30 minutes or until golden brown. Let cool. 1. Optional: Melt white chocolate according to package instructions. Drizzle chocolate over the tops of the macaroons and sprinkle with additional lemon zest. Let dry. One lemon should yield enough juice and zest for one batch. Per Serving: Calories 100, Total Fat 4.5g (Saturated 4g, Trans 0g), Cholesterol 5mg, Sodium 75mg, Total Carbohydrate 13g (Dietary Fiber 1g, Total Sugars 11g, Includes 0g Added Sugars), Protein 2g, Vitamin D 0%, Calcium 2%, Iron 0%, Potassium 2% *Nutritional values are an approximation. Actual nutritional values may vary due to preparation techniques, variations related to suppliers, regional and seasonal differences, or rounding.